Unstructured military style caps made with 55% Hemp and 45% certified organic cotton and colored with eco-friendly reactive dyes. Fair Hemp military caps are the perfect outdoor accessory for eco-activists everywhere. Hemp offers far more ultraviolet protection than traditional cotton (UPF 50+), making it the ideal material for headwear. Hemp is also well known for its strength and durability so a Fair Hemp military cap will last far longer than a traditional cotton cap. 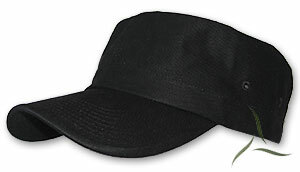 Additionally, Fair Hemp headwear is a great choice for the environmentally conscious promotional item. Replacing 1000 traditional cotton baseball hats with Fair Hemp hats saves over 44,000 gallons of fresh water that would be used in cotton production and keeps over 72 pounds of chemicals and pesticides out of our environment. Even the plastic that is used to shape the brim of the hat is made from recycled plastic! For customizing as few as 12 hats you can use any local embroiderer to complete your hat or we can suggest one we've worked with. If you are looking for something more elaborate, our Custom Headwear Program allows you to specify styles, colors and embroidery at time of manufacture starting with as few as 1000 caps.